That should work. An obvious question, but did you use an inverted envelope from Maths? This is how I would do it. So you want to set the level as a constant on the VCA using Level, hit the trigger input of Maths with a multed copy of the kick trigger into say, channel 1, and then turn the attentuator knob counterclockwise. 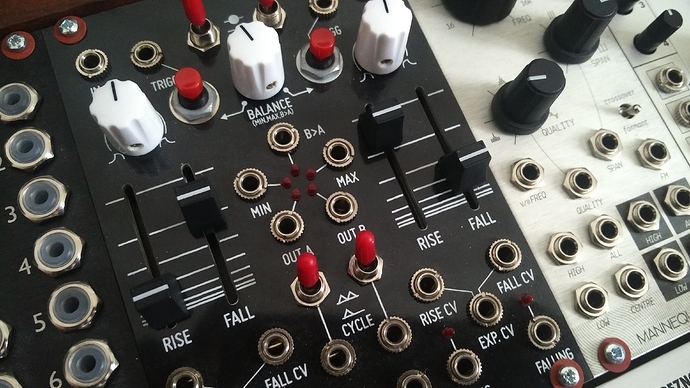 Take the inverted envelope out of the channel 1 mixer output and into the CV input of the VCA. Turn up the attentuator on the VCA to increase the amount of ducking; use the controls on Maths Channel 1 (you’ll want a slow attack) to sculpt the ducking. DUSG tracks 1v/o very well, but is more bare bones. Befaco uses less space and gives you the whole analog logic part plus a slightly more intuitive user interface - at least I prefer the sliders over the knobs and the knobs on the DUSG seem to be functioning weirdly backwards from what I would have expected (turning the rise knob clockwise makes the rise faster, i.e. if you’re thinking of it as an envelope, you turn the attack clockwise to make it shorter). They’re both nice, though. Wouldn’t want to knock the DUSG, just tried to think of things one might want to know before making the decision. The switches for rate (at the top) are also vey playable to introduce bursts of faster or slower cycles. I was originally after a Maths, but bought it as I found a cheap one on ebay. Super happy with it. But mine had slippery little knobs for the response curve, and I wasn’t into the sliders all that much. I also didn’t like how setting the speed to “slow” to get long enough decays meant losing any chance at a snappy attack. The output impedance was a little weird too, not driving passive LPGs for instance. I wound up getting a Function and a Contour instead (along with the Mini Slew I already had) and I think that’s my ideal setup. I’ve considered a DUSG. Heard it was a simpler build compared to Befacto. The 1 v/oct tracking would be the main draw for me, as I have a Maths. It’s a ridiculously easy build, since it’s mostly smd and the pcbs from randomsource come with all smd presoldered. You’re basically soldering in the knobs and jacks and put on the front panel. Rene + Tempi was my main sequencing block for a while and they truly were made for each other. The pairing is obvious for clocking the x&y axes with different clock divisions, but can really come alive when you start feeding the logic inputs with different clocks, as well. The ability to control the duty cycle of the clocks in the logic inputs will have lots of implications on how each axis will advance. Running a set up like this and manually turning on and off access to certain stages can get you far. Not saying you need Tempi, but having lots of clocks available will open up a lot of uses. Or an alternative: clock one axis with a gate pattern and the other with a slower clock for more variation. Also, clocking one axis and playing the other by hand is fun. Also also, you should watch all of @jamescigler 's Rene videos if you haven’t already! Finally, I’d recommend playing with the CV inputs for the axes (keep those attenuators low). One time I patched two phasing lfos into the CV ins that gave a cool circular motion through the grid. 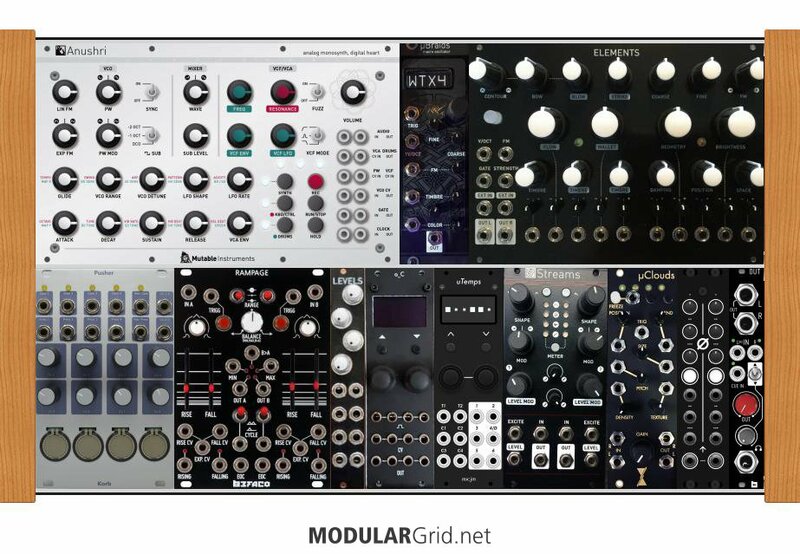 I’m looking to add some additional hands-on interaction to my Eurorack rig. I’ll be ordering a Grid soon, and an Arc when they’re back in stock. Any experience with Tetrapad or Planar2 to share? If I want to stair-step CV across a given range, effectively quantizing to some number of divisions (ex: 32 divisions across a 5+/- range), what am I looking for? It’s kind of bit-crushing, kind of division, kind of quantizing, kind of camparator? I’ve implemented it in Teletype a few times, but I’m curious about dedicated hardware options for this purpose. Thanks! Sample and hold is what you want pretty much. Steps are set with each gate/trigger. I quantizer would work. Something ornament and crime. I think he meant like a quantizer but with a definable number of divisions. Yes, I mean like you’re saying: essentially a quantizer with a definable number of divisions rather than specific v/O values. Rounding voltages to fixed values within a range of values. It sounds like there probably isn’t an obvious tool I’m overlooking? That would probably be easy to add as a mode in the new Ornament and Crime alternate firmware thing whose name I forgot (the one that makes it behave as a dual module). Hemisphere, right? I don’t have O_C, but I’ve beem considering it. Hi lines, I’d be curious about your opinions and observations of the all-DIY 6U x 84HP rack I’ve been slowly planning for a year and building for a few months. I have panels and PCBs for all the modules shown. When the last few parts arrive this week, I will have completed the Anushri, Pusher, Rampage, Levels, o_C, 6MIX and output, and am pretty sure that will be enough to start having some fun! The long-term plan is to either sell or relocate the Anushri to it’s own case and replace it with whatever I decide I need based on my experiences. I might do the same with Elements, replacing it with a Rings + something, or something completely different depending on how I like it. I’m pretty sure I will replace the 6MIX with an attenuated Nearness, and am on the fence about the micro-braids, especially as it’s a bit of an awkward build (maybe a triple sloth there instead?). I’m also considering swapping the passive Levels out with some flying attenuators if I decide that it’s ergonomically awkward to have it racked. My goals are to create a playable standalone instrument for creative sound design, to contrast my more conventional “MIDI-controlled subtractive analog-ish” Shruthi and Ambika, with the side-goals of experimenting with self-playing/generative patches, and experimentation with my MIDI hurdy gurdy. Shot in the dark question. My Bastl TEA KICK is responding to triggers too slowly. If I send too many triggers to it, the TEA KICK begins to skip triggers. I do not like this behavior. Is this normal TEA KICK behavior or is my personal TEA KICK busted? Thanks in advance for any thoughts. I like to make Maths self oscillate and feed it into Clouds. Maths doesn’t really track like a regular oscillator but it does produce some interesting harmonic content to sculpt via Clouds.